In business, it isn’t easy to compete with industry leaders. It’s hard to anticipate your direct competitors’ next moves. Given the increasing occurrence of disruptive innovation, it can seem nearly impossible to predict the completely unpredictable — such as a non-competitor entering your market or niche and crushing you. Competition from non-competitors entering your industry, market, or niche can and does happen. Want to improve your company’s ability to predict unexpected competition (and even fortify your performance against current competitors)? Challenge your team with creative reverse thinking exercises. Divide your team into small groups and then ask them to chart the path, process, and activities a non-competitor could take to proactively enter one of your sectors or markets and usurp your current competitive advantage. The more disparate the non-competitor the better. An example: how could McDonald’s (or Mattel) enter the hybrid electric vehicle market and beat the hybrid engineering team at Toyota? “How Could (X) Do (Y) and Win” transforms the normal/logical direction of competitive benchmarking/planning and shifts the focus from whether something might happen to HOW it might happen, thereby encouraging creative thinking and problem solving. It not only enhances your ability to predict unpredictable actions from non-competitors; it helps you hone your positioning and strategic advantage against known competitors. You’ll also reveal hidden assets, potential weaknesses, and profitable opportunities. According to Jack in the Box’s Chief Corporate Strategy Officer, Jack in the Box benchmarks their business “against” Hampton by Hilton hotels. Hampton was named the #1 franchise by Entrepreneur Magazine in 2010 and consistently demonstrates innovative franchise thought leadership. Since Jack in the Box aspires to be a “franchise leader” in the fast casual restaurant industry, Hampton makes for a great non-competitor benchmark. When it comes to Jack in the Box, Hampton is open to meaningful, actionable ideation and collaborative, cooperative information sharing without regret — the two companies can speak freely without threat of insider collusion. Decision making involves both forward and reverse thinking. 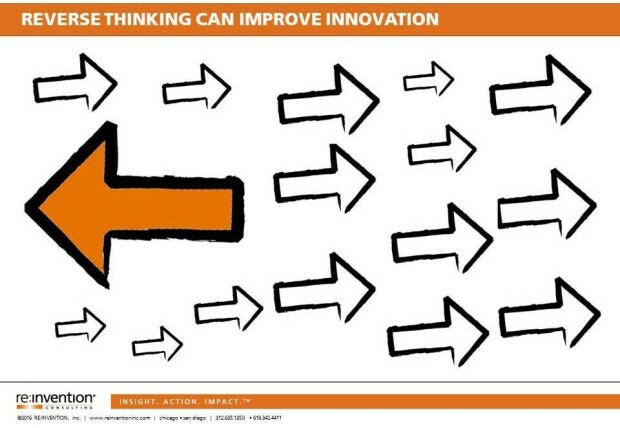 Improve your team’s reverse thinking capabilities and you’ll boost your company’s ability to innovate. Kirsten Osolind is a brand and business reinvention strategist with executive team transition and M&A due diligence / brand integration experience. A former Fortune 100 executive, she has worked for four of the world’s most innovative companies according to Fortune Magazine™ as well as advised numerous middle market and venture-backed growth stage companies.